This model runs to reproduce published results in COR and OpenCell. The units are consistent throughout. This model currently reproduces Figure 4. The initial conditions were estimated and the model run to steady state to yield precise values, changing any parameters will necessitate repeating this procedure. ABSTRACT: Under certain well-defined conditions, a population of yeast cells exhibits glycolytic oscillations that synchronize through intercellular acetaldehyde. This implies that the dynamic phenomenon of the oscillation propagates within and between cells. We here develop a method to establish by which route dynamics propagate through a biological reaction network. Application of the method to yeast demonstrates how the oscillations and the synchronization signal can be transduced. That transduction is not so much through the backbone of glycolysis, as via the Gibbs energy and redox coenzyme couples (ATP/ADP, and NADH/NAD), and via both intra- and intercellular acetaldehyde. Schematic representation of the model. 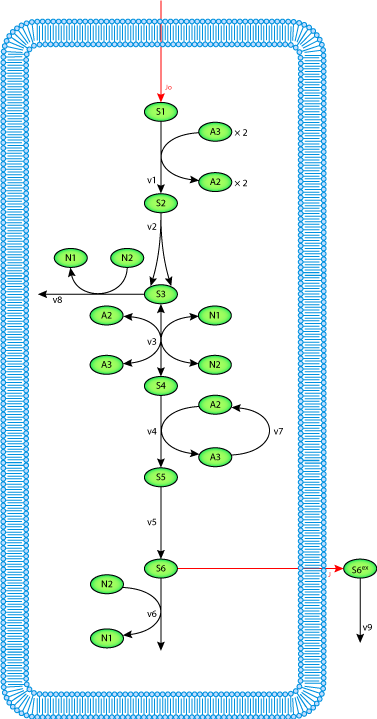 The nine variable model includes all shown metabolites as variables where S1 represents glucose, S2 represents fructose-1,6-bisphosphate, S3 represents the triphopshate pool, S4 represents 3-phosphoglycerate, S5 represents pyruvate, S6 represents intracellular acetaldehyde, S6,ex represents extracellular acetaldehyde, A2 is ADP, A3 is ATP, N1 is NAD+ and N2 is NADH. Derived from workspace Wolf, Passarge, Somsen, Snoep, Heinrich, Westerhoff, 2000 at changeset 780e7c5eb2b7.